Scroll saws are fine-cutting tools. They cut around the the smallest corners of any instrument. For this reason, they are used to create works of art. Scroll saws use patterns to cut thin pieces of wood into delicate designs. There's a pattern for just about anything. Get creative with a scroll saw. If you can't find a pattern, draw your own. Some of the finest examples of artistic scroll saw craftsmanship are the elaborate reproductions of cathedrals and churches. European craftsmen spend years on one project alone. With each project containing thousands of pieces, the fabrication of a scaled-down cathedral is best left to professionals. But it's possible to use their inspiration to create your own smaller scale churches or even Victorian mansions. Filigree and gingerbread patterns are available for overlay onto basic wood structures like doll houses or even small wooden houses that you build in your own workshop or garage. Holiday patterns are popular scroll saw projects. Small Christmas tree ornaments such as miniature sleighs, trees, Santa figures or snowmen have always been popular. Even religious figures can be cut out using patterns that can be found online, or you can draw your own. Other special decorations can be fun. Halloween has become a popular theme for decorations. Jack-o-lanterns have been entertaining scroll saw projects. Black cats and scarecrows are simple and fun to cut out. Nothing says you care more about someone than saying their name. When you take the time to cut someone's name out of wood, it becomes special. You can download the font of your choice, use it to print out someones name on a piece of paper and use that to create a custom nameplate. You can hang the scroll saw name on a bedroom door or desk. 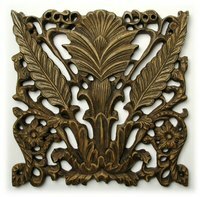 Grape-leaf is one of the oldest and most familiar of all scroll saw patterns . The delicate vines, leaves and plump grapes have adorned church altars and pulpits for centuries. You only need a pattern about 10-inches long that repeats itself for longer applications. You can draw your own grape leaf pattern; it doesn't have to be perfect. Use a picture to use for reference. They are easy to find online. Or you can just download the picture, print it out and use that to trace around, then cut it out.